We’d love your help. Let us know what’s wrong with this preview of For This Life Only by Stacey Kade. And when he woke up, nothing was the same. Elijah, his twin brother, is dead, and his family is broken. Jace’s plann A young man struggles to move forward after the death of his twin brother in this gripping, coming-of-age tale about loss, redemption, love, and the moment you begin to see the world differently. To ask other readers questions about For This Life Only, please sign up. Stacey Kade’s 738 Days was one of my favorite reads this summer. So my heart was ready to love and leap into this book at first sight! But…Yes, there is a but. My heart ended up disappointed. For This Life Only introduces us to twins Jacob (Jace) and Eli and the whole Palmer family. Mr. Palmer is a Pastor in a small community. A father and leader with a lot of responsibility—the whole family feels the weight of responsibility actually. Jacob has always felt the pressure to be “good”. But tragedy spins Jacob and the whole family upside down. Eli is killed in an accident. Futures crushed and taken in an instant. The pain and loss bring tension and doubts into Jacob’s world. Can their faith and family survive the loss? I wish the story remained focused on Jacob and his family’s grief. The idea of a family of faith struggling with their beliefs and way of life is a powerful one. But unfortunately the story splinters off into other points that steal a lot of that power. The romance part of the book was the big problem for me. After the accident, Jacob starts talking to Thera, a high school outsider with secrets and pain and troubles of her own. I liked Thera—well I didn’t dislike her anyway. But here’s the thing. I did not feel Jacob and Thera’s connection. I just didn’t buy it or FEEL it. And without that chemistry and connection, everything else kind of fell apart for me. When Jacob began fighting with his friends, it all seemed too sudden and dramatic. Both Thera and Jacob just started sharing these huge emotions with each other and all I kept thinking was—why? My heart didn’t see the trust or sparks. My whole reading heart wanted to try to understand Jacob’s new world without his twin at his side. When people looked at Jacob they saw Eli. THAT made my heart ache. And Sarah! I adored Jacob’s little sister. Her fear and pain ate at my heart and soul. The poor thing! But there were too many other issues and distractions mixed into the plot that just never made it to my heart. Never made it anywhere actually. A lot of issues were left undeveloped. Jacob lost so much that night in the accident. Not only his brother, but maybe his faith and his baseball career. These issues alone would have made a powerful story. I didn’t need the additional conflict and worry with Thera and her family. As a matter of fact, the big secret Jacob and Thera struggled with at the end was rather underwhelming. Death shakes us all to the core. From day to day life to faith in people and God. I was hoping for a more spiritual story here with Jacob and his family. As much as I appreciated the message of righting a wrong or finishing what one started, it just didn’t provide the emotional wallop I longed for. Sadly I cannot recommend this book. I have been gravitating more and more towards books about grief and loss lately, which is how Stacey Kade’s For This Life Only came to my attention. While I can’t say that it resonated as strongly with me as some of the other books I’ve read recently with similar themes, I still found the book to be well-written and thought-provoking. The best part of For This Life Only was the author capturing the voice of a struggling teenage boy so authentically. I’m not particularly a huge fan of books solely told in a male POV, but Jacob’s voice in this book was written in a way that made it easy to sink myself into the story and feel a connection to him. He was easy to sympathize with, given the grief, sorrow and guilt that he experiences at the loss of his twin brother. I loved how strongly his emotions came through during the book. He struggles a lot in For This Life Only especially because in his mind his twin, Eli, was the good brother, the brother who deserved to live a long life. It wasn’t easy to read, but at the same time, it made you want to root for Jace to somehow overcome this tough phase of his life. He wasn’t the only one suffering though and his whole family is turned upside down with the loss of Eli. His baby sister, Sarah’s, reaction to it was extremely poignant and heartbreaking. When Jace gets to know Thera, the town outcast, things to do start to look up for him. This isn’t the kind of story where the girl saves the boy from his misery, even the synopsis may make it look like that. Instead, Thera gives him the push that he needs in order to discover who his brother really was and what he was dealing with before his death. There was some animosity between Thera and Jace at the start of the book, but the two of them find comfort in each other and eventually fall in love. Though I would have wished for a little more build up, I found their romance to be sweet and swoony – they really were good together. Religion was a huge theme in For This Life Only and I can’t tell you how much I appreciated that. I think a lot of YA authors shy away from exploring religious themes in their books for fear of pushing away readers, but it’s a part of many teens’ lives, so I really think there need to be more books that do this. In For This Life Only, I liked how the religious themes were explored without coming across as preaching. Jacob’s family is very religious, his father being a pastor of the local church, and all, but he personally struggles with it, especially with topics about the after-life and what faith really means when his brother passes. It was very thought-provoking and is a main reason I urge everyone to give this book a try. I think where For This Life Only faltered a little for me was the actual plot. There’s a bit of a mystery regarding what Eli was up to secretly before he passed. One reason it didn’t really work for me was because it took some time to be introduced to the story, and I also felt like the ending chapters regarding this secret weren’t as fleshed-out as they could have been. To me, the mystery personally didn’t add much to the story. I stayed up late to finish this one and it was worth every minute of sleep I lost. Stacey Kade takes an honest, realistic look at family, faith, and the importance of discovering for yourself what you believe. No one can do it for you. Jace and Eli are PKs (Preacher's Kids). As so often happens to offspring of religious leaders, they've been cast in their roles as Sinner and Saint. They're held to a higher moral standard, expected to always make the right choi Thought-provoking. Engaging. Hopeful. Jace and Eli are PKs (Preacher's Kids). As so often happens to offspring of religious leaders, they've been cast in their roles as Sinner and Saint. They're held to a higher moral standard, expected to always make the right choice, but aren't afforded the same forgiveness and grace as their peers when they don't. Neither is Thera. Everyone thinks they have her and her mother all figured out. They would be wrong. Eli is the one everyone loves, depends on and respects. He's the one expected to do great things with his life. And Jace? Well, it'd be awesome if he could manage to stay out of trouble just once. When Eli dies leaving everyone, Jace included, with too many questions and not enough answers, Thera may be the only person who can help. I liked this! At first I was wary of the heavy religious themes, but Jace's doubt and exploration of faith after his brother's death made him all the more sympathetic. His inner dialogue with himself felt wholly convincing for a teenage guy. With a side of romance - though I wish Thera's character had been given the same amount of depth, especially considering her own troubles - I enjoyed reading Stacey Kade's newest. I was really looking forward to reading this book as I have enjoyed the authors other works. Unfortunately this book was not for me. The MC was rude and bitter. And I cannot read about rude and bitter people. It really bothers me. Also I feel like this book will be really dramatic. Imagine a gender-swapped Footloose from the perspective of the preacher’s kid, and if you shift the focus from dancing you have For This Life Only. Kade takes the death of the “good one” of the preacher kids and explores how it shatters a family that’s not allowed to be less than perfect. The family dynamics are heart-wrenching, especially the issues Jace’s little sister has. And it’s very easy to relate to Jace feeling stifled by keeping up appearances. Sure, the romance is a touch Insta, but e Imagine a gender-swapped Footloose from the perspective of the preacher’s kid, and if you shift the focus from dancing you have For This Life Only. Kade takes the death of the “good one” of the preacher kids and explores how it shatters a family that’s not allowed to be less than perfect. The family dynamics are heart-wrenching, especially the issues Jace’s little sister has. And it’s very easy to relate to Jace feeling stifled by keeping up appearances. Sure, the romance is a touch Insta, but everything else is so excellent that I don’t care. Most books argue either for belief or against it. This is the first one, to my memory, that leaves the choice up to you. 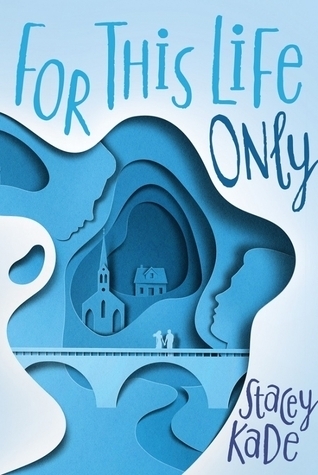 For This Life Only by Stacey Kade is an emotionally moving coming-of-age story filled with heartache, love, forgiveness, and learning to find yourself. Jacob "Jace" Palmer is the black sheep of the family at least in comparison to his twin brother, Elijah, and his little sister Sarah. His only desire was to play baseball and get a baseball scholarship so he could get far away from home as possible. Where he'd only have to be worried about himself. However, a night of partying and needing a ride h For This Life Only by Stacey Kade is an emotionally moving coming-of-age story filled with heartache, love, forgiveness, and learning to find yourself. However, a night of partying and needing a ride home from his brother Eli changes his life forever. A tragic accident leaves him without a brother and no longer able to play baseball. Completely grief-stricken, Jace, along with his family, don't know how to move forward and live with the loss. How do they continue on when the world is completely changed? Stacey Kade has created such a great story with strong characters especially amongst Jace, Eli, Thera and Sarah. Each of these characters stood out for me especially the juxtaposition of how Jace deals with his grief of losing Eli and how Sarah deals with hers. The parents as well, each had their own inner thoughts and guilt that differed from the other that they had to overcome by the end and Ms. Kade displayed their falling apart and picking up the pieces together realistically and with so much feeling. I also liked Thera. She's blunt, tough, and she helps Jace come to terms with his feelings about his near death experience, losing Eli, and finding out there was more going on with his brother than he noticed. Her side-story with Eli, her mom, and Riverwoods was interesting, but I really feel the heart of the story for me was Jace and his family. Little Sarah definitely pulled at my heartstrings. Overall, I enjoyed For This Life Only and definitely recommend. It's well-written, realistic, emotional, and filled with characters that just pull you into their story. I can't wait to read more from Ms. Kade. Jace and Eli are twins...and complete opposites. Jace is the wild child who struggles in school and in life while Eli is the golden boy, acing everything effortlessly and following in his father's footsteps, possibly as a pastor in the church. But then comes the terrible accident, changing everything completely. Eli is killed, and Jace is left to come to terms with his twin's death, the collapse of his family in the aftermath, and Jace's own involvement in the accident. I really enjoy Stacey Kade's writing, so For This Life Only was a must read for me. It is just as heartbreaking as the summary makes it sound, as well as uplifting and purposeful. I loved the themes of this story - grief, soul searching, faith, families of the church, expectations and choosing to do the 'right' thing even when you're not sure what that is. In Jace's family he is the destructive twin, while his brother Eli manages to effortlessly maintain the levels of perfection their dad craves I really enjoy Stacey Kade's writing, so For This Life Only was a must read for me. It is just as heartbreaking as the summary makes it sound, as well as uplifting and purposeful. I loved the themes of this story - grief, soul searching, faith, families of the church, expectations and choosing to do the 'right' thing even when you're not sure what that is. Jace is a fantastic protagonist and narrator. He is struggling with the death of his twin, guilt over his involvement in the crash and is scared that Eli might not be in that finally happy place after all. His family is falling apart and that just adds to the guilt. Add to that he can't play baseball anymore and he doesn't have anyone to talk to about his doubts. And his father!! I wanted to shake him. Pastors!! Ahggg. Don't get me started. In her acknowledgments, Stacey says that writing about something she experienced (growing up in the church) was harder than she imagined, but I think she did a spectacular job. As always, it is so easy to disappear into her books and everything felt genuine and just as complicated as real life. There weren't really any big twists or mysteries to be revealed in this story - this isn't a suspense. Nor really was it a romance, though there certainly is that element. The romance isn't the main focus of this story but it does provide that gentle shove Jace needs to help him start questioning some major things in his life. It is also very sweet and I loved the moments between Thera and Jace. Their connection was gentle and understanding but their passion was fiery. Loved it. Overall, as expected, For This Life Only was as touching and beautiful as it was enjoyable and easy to devour. Stacey Kade is a brilliant author and I can't wait to read what she produces next. I really enjoyed this book. I was having quite the long day inside the lab, when I decided to pick this book up so I was able to read it in one sitting, while doing some lab works. And it was more than enough to keep the boredom away. This book's portrayal of grief is so amazing, I could feel every emotion. Jace and Eli are twins, who got into an accident, which got Eli dead. Jace's life changed from that point, and he started to question everything in his life, especially things about his brothe I really enjoyed this book. I was having quite the long day inside the lab, when I decided to pick this book up so I was able to read it in one sitting, while doing some lab works. And it was more than enough to keep the boredom away. This book's portrayal of grief is so amazing, I could feel every emotion. Jace and Eli are twins, who got into an accident, which got Eli dead. Jace's life changed from that point, and he started to question everything in his life, especially things about his brother. I really like the voice of Jace in the story. It's raw and full of emotions, which makes it very realistic for someone who just lost his other half. I love his relationship with Eli and their little sister, Sarah. He also has a great character development and I really enjoyed seeing his character grow. He used to be with the jocks, being sporty and all but that changed after the accident, which led him to meet Thera. I also like Thera's character. She's very interesting and I enjoyed her story as well. It's quite nice to read a story that doesn't focus much on the romance, although I have to admit that the chemistry between Thera and Jace is really good. Friendships in this book was portrayed really good too. Even with Jace falling out with some of his friends, it's quite reassuring that he was able to reconcile with them. There was also a heavy religious theme surrounding this book, which was depicted pretty well and it added depth to the story and to Jace's character, and his family relationship. We spent a lot of time putting you back together. Oh man, Ms. Stacey Kade, you have made my heart go through so many emotions once again (ICYMI: Stacey put out the amazing NA book, 738 Days, earlier this year and it's a top contender for best book of the year for me!). Forewarning: For This Life Only manages to make your heart drop and sing all in the same book. SO.MANY.FEELS. First, let's meet our characters. You've got Jace and Eli, twins who may or may not be more alike than they realize, plus We spent a lot of time putting you back together. First, let's meet our characters. You've got Jace and Eli, twins who may or may not be more alike than they realize, plus their sister and parents. Papa Palmer is not only the family Patriarch but the town's beloved Reverend. Eli is following in his father's footsteps while Jace is just trying to be a normal teen, much to his father's dismay. Gotta keep up appearances! On the flip side is Thera, daughter to the town psychic, who can't catch a break thanks to the pressure for her mom to close up shop. Jace, out at a party with his friends, asks Eli to pick him up and drive him home. The two are driving home when Eli randomly comes out with, "Do you think there's a difference between doing the right thing that definitely hurts one person and doing the right thing that might hurt a lot of people?" Before the two can get deep into the conversation, Eli loses control of the car and Jace's life is forever changed. Upon waking up, Jace learns he not only lost the ability to pitch but also his twin. As you can imagine, Eli's loss impacts a lot of people, from their sister who is constantly worried about Jace's safety to Eli's girlfriend to Thera, who Eli was tutoring and working on another project with. This book is about putting things back together again, or not, depending on how broken they are. It's about loss and recovery. The moment of Eli's loss was jarring and real. Jace's journey, along with those around him, is raw. Now that he can't play baseball, will he still fit in with his teammates? Will he ever know what Eli was talking about right before his death? What was Thera to Eli, really? Is anything as it seems and can he trust those he thought he knew? Add on top of that the fact that he has a pressure to be perfect in the eyes of a community who holds the cards to his family's wellbeing. Jace's questioning of the afterlife, thanks to his brief experience, is heartbreaking. Luckily Thera comes into his life, spunky and ready to help him. Stronger than either ever realized. Together, they explore Eli's last words and figure out what he was trying to tell Jace. It's clear that Stacey poured her heart into this book, both by the writing and through her acknowledgements. I took this book with me to a music festival and sobbed in public as I read through the ending. I was really cutting it close, considering this book releases tomorrow. It was sent to me rather late in the game, but I managed to finish it with hours to spare. We meet Jace and his brother Eli. They both get into a car accident late after Eli picks Jace up from a party. Jace dies for three minutes, but Eli is forever gone. It takes a while for Jace to adjust and it's hard. He lost his twin brother. He watches as the tragedy nearly rips his ow I RECEIVED THIS ARC IN EXCHANGE FOR AN HONEST REVIEW. It takes a while for Jace to adjust and it's hard. He lost his twin brother. He watches as the tragedy nearly rips his own family apart; parents arguing and his sister hiding in herself. He encounters Thera, who was Eli's friend. They are sucked into this "insta-love" relationships where Jace realizes she needs his help. One thing that bothered me was the lack of connection with Thera and Jace. Let me rephrase that. It happened so fast they didn't really have time to get to know each other. But, it was cute to read about them and how they did connect with each other. Really beautiful exploration of faith and grief. Don't be put off byt he religious aspect. It's a strong factor in Jace and his families life but it's very well done - respectful but not overwhelming or preachy. There's a small subplot about the church that I didn't love (I wish the focus stayed on the family) but I do see how it tied everything together in the end. I did like the book.. but I didn't love it. I did not find it very moving.. even though some though stuff happened I could not get into it. I don't know if it was because the narrator was male ? I did like how the accident made the main character doubt everything and how he learned to think for himself, and that it is okay to question stuff. All in all not a very special novel, but is was okay. I was intrigued by the premise but the father was too sanctimonious for me. I also wished that there had been a certainty about Eli's fate. Oh man, I'm not crying, a bug just flew in my eye. "I miss you. Every day for the rest of my life, however long that is. And I'm looking forward to seeing you again." I didn't really know what to expect from this book. Reading the synopsis, all I knew going into it was that Jacob lost his twin brother in a car accident, and he and his family are struggling to cope in the aftermath of his death. Then Jacob meets this girl, Thera, who seems to help him through this tough time. WELL, I am here to te Oh man, I'm not crying, a bug just flew in my eye. I didn't really know what to expect from this book. Reading the synopsis, all I knew going into it was that Jacob lost his twin brother in a car accident, and he and his family are struggling to cope in the aftermath of his death. Then Jacob meets this girl, Thera, who seems to help him through this tough time. WELL, I am here to tell you, that there is so much more to this book than you get a glimpse at from the book blurb. Jacob and his twin brother, Eli, come from a very religious family. Being twins, they are always compared to each other, and apparently Eli became known as "the good one." He follows in his father's footsteps, a pastor who keeps up appearances in their church community. Jacob somehow became "the bad one," if only because he's not as strictly religious as Eli. He goes to school, is a super good baseball player, and goes to parties like any other teenager. On the night of Eli's death, Eli and Jacob have a strangely vague conversation, in which you see Eli struggling with something deep down, and question what he has grown up to believe. Jacob never gets to find out that night though, because we lose Eli to a tragic car accident shortly after (no spoiler there, it was in the book blurb). After his death, Jacob has a hard time living a life without his twin, his other half. He blames himself for what happened, and throughout the book you see that all the family members blame themselves as well. "Jesus said to forgive seventy times seven, Jace, "she said with an admonishing look. Thanks, Leah, how incredibly helpful. I know the Bible verse-Matthew something--just as well as she did. But regardless, what the verse lacked was the how. How do you forgive someone that much? How do you forgive yourself? How do you stop being angry? I think no matter what situation you're in, or what religious preferences you have, many can relate to this. We all know what we should do or what the right thing is, but sometimes it is hard to carry through. If you're angry or hurt or feeling guilty about something, though you know you shouldn't feel that way, how do you let it go so easily? How do you just stop? All I know from my experiences, is that it takes time. And sometimes that's difficult too, to just wait for time to slowly take the sharpness out of the hurt in your heart. But, that's all there is. What did we always have to pretend everything was okay? Why couldn't we just admit that we were falling apart? If we couldn't do that, I wasn't sure how we were going to get better. Through his new friendship/relationship with Thera, he learns more about his brother. Surprised and hurt that his brother didn't confide in him, Jacob begins to question the lies that the people closest to him seem to have, all for the purpose of keeping up pretenses. His father, who is adamant about keeping up appearances for the sake of being the perfect family, a perfect example for others. His brother, who he learns was under so much pressure to keep being "the good one." But sometimes, it's okay to admit we're not okay. Sometimes it's okay to appear human. And that's something I wish everyone knew and understood. "...the world or existence or whatever is bigger than we allow ourselves to think. Which means that no matter what, we're only seeing part of the picture. Individual pixels. What looks like the end or like meaningless and painful chaos might just mean we're too close to the screen to understand." As a pastor's kid and survivor of a horrible medical incident, I was really excited to read this book, but I was severely disappointed. For This Life Only explores several themes that are much heavier than Kade's usual action-adventure romances. Survivor guilt, loss of faith and cultural bigotry are all twined around each other in this short novel. As usual, Kade's dialogue is snappy and her pacing is strong. She does an excellent job of moving the story from place to place, making the setting fe As a pastor's kid and survivor of a horrible medical incident, I was really excited to read this book, but I was severely disappointed. As usual, Kade's dialogue is snappy and her pacing is strong. She does an excellent job of moving the story from place to place, making the setting feel detailed and realistic. Unfortunately, all the issues overwhelm the characters. Neither Jacob nor Thera feels like a real person. Jacob comes across more as a pawn in the author's exploration of these topics, while Thera is simply an icon of everything Jacob has been taught to oppose. A deeper and more meaningful novel would have required paring down the subject matter to just one or two issues and spending much more time developing the characters. As it stands, the story slips through your fingers without leaving any impression behind. As usual, Kade's dialog is snappy and her pacing is strong. She does an excellent job of moving the story from place to place, making the setting feel detailed and realistic. Unfortunately, all the issues overwhelm the characters. Neither Jacob nor Thera feels like a real person. Jacob For This Life Only explores several themes that are much heavier than Kade's usual action-adventure romances. Survivor guilt, loss of faith and cultural bigotry are all twined around each other in this short novel. I'm grateful to Kade for addressing this topic, for writing a character who questions wether people truly end up "in a better place" after they die. It was interesting to read from Jace's pov as he struggled with the faith his parents were so desperate to hold onto in the light of tragedy. I felt like I cou This book was both beautiful and devastating, an honest portrayal of a teenage boy struggling to cope with his twin brothers death, and his desperation for answers regarding life after death. I'm grateful to Kade for addressing this topic, for writing a character who questions wether people truly end up "in a better place" after they die. It was interesting to read from Jace's pov as he struggled with the faith his parents were so desperate to hold onto in the light of tragedy. I felt like I could relate to him a lot, as I've never really been religious and don't really know what to believe in terms of life after death. This book made me SOB so so much. But it was worth it. It's a book that makes you think and second guess your presumptions regarding the afterlife and Jace was a very strong, very real main character and the way he was written had me grow very attached to him, helped me to understand each of his thoughts and actions. A heartbreaking, honest look at grief, faith, thinking for yourself, and choice. Jace's grief and guilt over his brother's death are piercing without ever descending into pathos, as are his family members', each of whom deal (or don't) in their own way. I would put this on par with Jeri Smith-Ready's This Side of Salvation when it comes to books about teens and faith that are not preachy or overtly focused on conversion, but instead focus on why you believe what you believe. Thoroughly satisfying teen novel that will appeal to readers looking for big questions to contemplate. Twin survives car accident and is left with questions of what's after, guilt and contemplation about who he is, helped by outcast girl from the opposite side of the faith spectrum. In three minutes Jace’s life changed. When he woke up, after an accident, nothing was the same, Elijah, his twin brother, is dead. This is the story of a young man who struggles to move forward after the death of his twin brother. I want to start my review by saying that the cover of this book is absolutely gorgeous. After learning that his brother did not survive the accident, and seeing his family fall apart before his own eyes, Jace son of the pastor of his community, begins to doubt his beliefs In three minutes Jace’s life changed. When he woke up, after an accident, nothing was the same, Elijah, his twin brother, is dead. After learning that his brother did not survive the accident, and seeing his family fall apart before his own eyes, Jace son of the pastor of his community, begins to doubt his beliefs and strives to remain sane. He was always the black sheep of the family and his twin the perfect son, but as time passes, Elijah does not seem to have been so perfect. I liked the rhythm and flow of the story, the characters are credible, and I also liked that the end was not a perfect and happy ending. Absolutely stunning writing and worth reading. Jacob Palmer is a PK or Pastor's Kid and has difficulty living under the family strictures requiring him to always be on his best behavior since the neighbors might be watching and judging his actions. To make matters worse, his twin brother Elijah is on the fast track to follow in the steps of both his father and grandfather to become the pastor at the local church which has become a family legacy. Needing to get away from another night of scrabble with his parents and young sister Sarah, Jace Jacob Palmer is a PK or Pastor's Kid and has difficulty living under the family strictures requiring him to always be on his best behavior since the neighbors might be watching and judging his actions. To make matters worse, his twin brother Elijah is on the fast track to follow in the steps of both his father and grandfather to become the pastor at the local church which has become a family legacy. Needing to get away from another night of scrabble with his parents and young sister Sarah, Jace takes off to hang out with his friends, bumming a ride off his twin. Making it an early night so as not to break curfew, he has to call Eli to pick him up after he accidentally gets doused with a cup of beer (can't let his dad know he's had a sip or two). On the way home the car spins out on a patch of ice and their vehicle goes over the bridge killing one boy and almost taking the life of the other. meaning platitudes of his classmates and the community. Inexplicably Jacob finds himself seeking comfort from the school pariah, the daughter of the psychic who lives across the street from the church with the garish neon sign which makes his dad fume. This girl is off limits even to his friends since they hold her responsible for losing the state championship when two seniors were suspended based on her allegations of sexual harassment. Yet Jace sees a different side to the once hated Thera and, through her, starts to view life via a different lens. For This Life Only by Stacy Kade is a powerful story dealing with some heavy topics such as sexual abuse, faith and religion, death and grief, loyalty and rejection. Kade shows a realistic snapshot of a family trying to deal with a senseless loss. While there's a lot going on with various subplots, unfortunately many of the characters aren't fully developed and the story doesn't quite gel. A further complication is the quick but confusing resolution leaving out some pertinent details which prevent the reader from attaining a fulfilling closure. While many YA books tend to be too wordy and need a little editing, this one could have easily added another fifty pages to properly wrap things up instead of using an epilogue to try and put a bow on a slightly incomplete story. Three and a half stars and a thank you to Netgalley for providing this ARC in exchange for an honest review. This review also appears on my blog, Gotta Read. I liked Stacey Kade’s The Goth and the Ghost series, so when I read the description of this book, I was curious about her more serious take on death and the afterlife. While I thought there were a few things about this book that could have been stronger, all in all, I thought it was a good read. Eli and Jace are identical twins and the sons of the pastor of a megachurch. They are both expected to be perfect, but while Eli seems to have no trouble doing what is expected of him, Jace struggles with I liked Stacey Kade’s The Goth and the Ghost series, so when I read the description of this book, I was curious about her more serious take on death and the afterlife. While I thought there were a few things about this book that could have been stronger, all in all, I thought it was a good read. Eli and Jace are identical twins and the sons of the pastor of a megachurch. They are both expected to be perfect, but while Eli seems to have no trouble doing what is expected of him, Jace struggles with being a “preacher’s kid” and sees himself as the “bad” twin. When Jace’s request for Eli to pick him up after a party leads to Eli’s death in an accident, Jace struggles with feeling like the wrong person died. He also struggles with his faith, since he also died in the accident and came back with no sense of God’s presence. When Jace gets to know Thera, the daughter of the local psychic, she begins to help him work through his grief and doubt. His relationship with Thera is a problem, though, because Jace’s father hates what Thera’s mother does and the fact that she lives and runs her business right across from his church. In general, I liked this book. I liked both Thera and Jace as characters, and I thought the author did a good job developing the relationship between Thera and Jace. Unlike the other people in his life, she doesn’t have expectations for how he should behave or think, which frees him to grow and change as a person. I also appreciated the way the author explored Jace’s crisis of faith after his brother’s death. It’s entirely natural to question God’s presence in the face of tragedy, and Kade doesn’t simplify Jace’s struggle to maintain his faith. Rather than turning this into a Christian novel by ending with an unambiguous assertion of Jace’s belief in God, the author leaves him continuing the process of questioning and exploring his faith, which I thought was a realistic touch. The biggest problem I had with the story is that I thought that a few things resolved themselves a little too easily. I felt like Thera helped get Jace back on track almost too quickly, but maybe it’s just that the author jumps the book forward in time. Kade opens with the accident and then picks up the action when Jace goes back to school, jumping over several months of him struggling with his grief and the changes in his life. I also thought that the problem of Thera’s mother’s business was solved too quickly and neatly at the end of the story. Even though I had a few quibbles with the book, I would recommend it to readers looking for a novel exploring grief and faith in the face of the loss of a loved one. Jacob (Jace) and Elijah (Eli) are twins who look exactly alike, but they are anything but identical. Eli is the good son, the one who follows his father’s religious leanings. Dad is a minister of a big congregation that is set on expansion. Jace is the problem son who is more secular in his attitudes and who gets in trouble. When they are both in a terrible car crash, Eli is killed. Now Jace feels like he’s responsible and thinks his family and almost everyone else, wishes he was not the twin wh Jacob (Jace) and Elijah (Eli) are twins who look exactly alike, but they are anything but identical. Eli is the good son, the one who follows his father’s religious leanings. Dad is a minister of a big congregation that is set on expansion. Jace is the problem son who is more secular in his attitudes and who gets in trouble. When they are both in a terrible car crash, Eli is killed. Now Jace feels like he’s responsible and thinks his family and almost everyone else, wishes he was not the twin who survived. Jace’s little sister has stopped talking and is ever fearful that Jace could die too. But Jace is not unscathed by the accident. His baseball dreams are over since he needs his arm to pitch and it doesn’t work right anymore. When Jace learns that Eli was seeing another girl besides his longtime girlfriend, he begins to wonder about the strange declarations Eli made just before the accident. He wonders if this girl, who’s a total outcast at school, has answers to some of the questions that plague Jace. Kade takes on the good twin/bad twin plot without focusing as much on the individual’s actions but on the inner turmoil of facing hard truths. There is a faith crisis that Jacob is dealing with that is central to the book. Not only is he struggling with guilt, the loss of his status as a jock, questions about his brother’s intentions and confusion over his personal beliefs, but he is facing the devastating reality that he lost the person he was closest to. Many others also miss Eli and there’s plenty of grief and loss in the family and the community. Jace’s little sister is a moving and sad character; her silence speaks volumes. The outcast girl Thera is strong minded and resilient, the subject of constant bulling and taunts at school. She is a survivor who has learned not to rely on others. It would have been interesting to hear more about her difficulties and coping mechanisms. Still, it's Jace’s life that has changed dramatically and it’s his personal conflict that makes the book a success. Prior to writing full time, Kade worked as an award-winning copywriter for several Fortun The daughter of a minister and a music teacher, Stacey Kade grew up reading Harlequin romances on the sly in the basement. Kade is the author of two young adult series (The Ghost and Goth trilogy and the Project Paper Doll series). Her first adult contemporary romance, 738 DAYS, was released earlier this year.